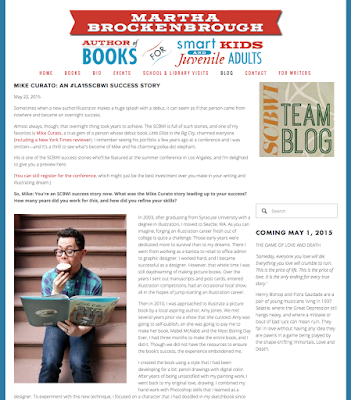 Click on over to read this chat between SCBWI Team Blog's Martha Brockenbrough and debut author/illustrator Mike Curato. "Make things that make you smile inside." Mike will also be co-leading a Saturday Breakout session with agent Brenda Bowen on "The Artist Agent Relationship!" We hope you can join us for #LA15SCBWI – and perhaps it will be the path to your own SCBWI Success Story! Detailed conference information and registration here.